Today's card is one of the 20 unique cards that you can make using the Watercolor Wishes Card Kit, available through me, a Stampin' Up! Demonstrator in the UK. This all-inclusive kit has everything you need (except your choice of adhesive) including card bases and envelopes, sequins, washi tape, Stampin' Spots and more. This kit is so simple and a lot of fun to assemble. It comes in a gorgeous box and you're left with twenty gorgeous and different cards that are perfect for every occasion. You can follow the instructions or you can choose to make your own designs. 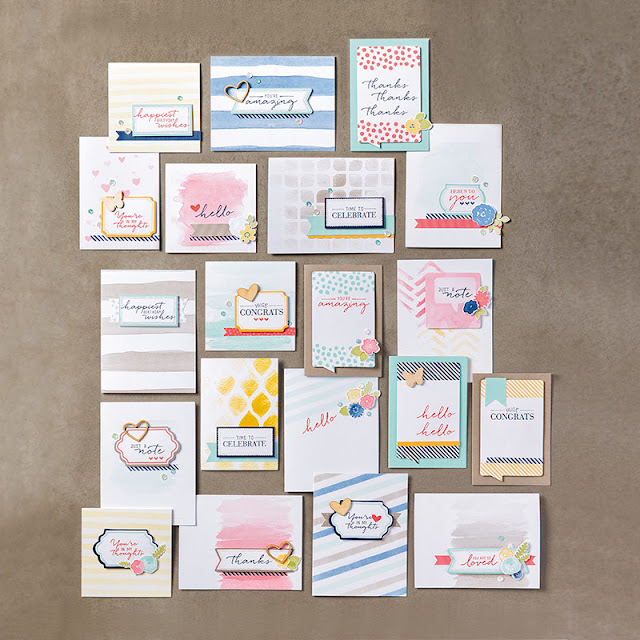 For example you could stamp every card with a birthday greeting if you needed lots of birthday cards, it's entirely up to you!